Ugga Bugga slot game is a 3 reel 1 line Multi-Spin machine. It’s far from being a classic spin-and-win slot machine. Personally, i like to have some control over, otherwise i get bored. This one i can play for hours. The best part is that if you play it right, which is not hard, you get the best paying slot machines online, followed by NetEnt’s Blood Suckers and Rival Rock On slot. 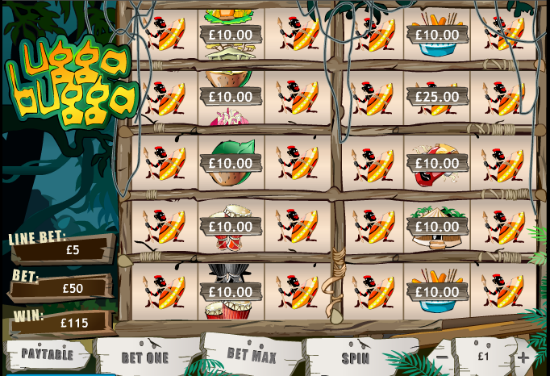 As we said, Ugga Bugga is a multi-spin slot. If you never played this type of slots, what it means is that after hitting spin for the first time, you get to choose which reels to hold. Then you hit spin again, respining the remaining reels. Ugga Bugga features 10 raws. When hitting re-spin, you will spin 10 sets of reels and will be paid the winning combinations on all 10 sets or reels. You can say that Multi-spin slots are kind of mix of slot machine with video poker. In this case, multi-hand video poker. It may sound complicated, but it’s actually a very simple slot to play and takes only few spins to get used to. The only important thing is to remember the paytable. I often make a screenshot and just have it open next to the game. First, it’s fun and exciting. 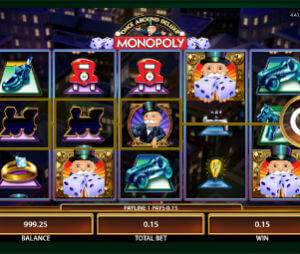 Personally, this is one of my top 10 online slots. Second, it pays well. With 99% RTP, this is the best paying slot machine Playtech has to offer. Currently, there are only 2 online slots with higher RTP, Jackpot 6000 and Mega Joker, but unlike Ugga Bugga, those 2 are really tricky (that’s why we don’t have them on our Loosest Slots list). 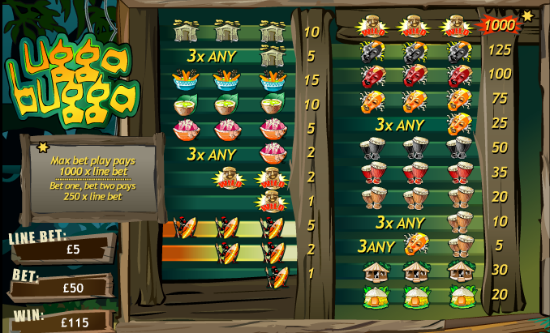 The design and the symbols of Ugga Bugga slot game are taken from the African Tribe scenery. The wild Idol is the highest paying symbol and it substitutes for all other symbols. Other high paying symbols are the African masks, black, red and gold and the drums. All winning combinations consist of 3 similar symbols, the only acceptation is the wild Idol and the Tribal man, which pay out every time you get them on the reels. The minimum bet per line is $/€ 0.01 and it goes up to $/€ 5, which means that the bet per spin goes from $/€ 0.1 and up to $/€ 50. The maximum payout is x1000.